Thank GOD the twins are putting on a bright, fun and exciting show again! After my less than favorable denim reviews for last season, Dsquared‘s brothers came back to us! Identical twin denim designers, Dan and Dean Caten held their show in Milan but took us to Glastonbury’s Heineken Jammin’ Festival. In the beginning of the show, the sod runway was dry, then sprinklers switched on and it turned to mud for a real festival feel! With the models stomping through the mud, U2 and Coldplay anthems played. The styling was spot on. 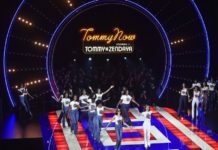 Models were dressed in your typical denim cutoffs, plaid button-downs, skinny jeans and T-shirts accessorized with armfuls of neon wristbands, slouchy suede bags, headscarves, mirrored shades. Lest we not forget to mention the essential beverage of Glastonbury, the Heineken.